Yarmouth and Waynflete also capture South regional victories. CUMBERLAND — Kialeigh Marston of Bonny Eagle sounds almost motherly when talking about her young teammates. Bonny Eagle, behind two seniors and three freshmen, won the Class A South girls’ cross country meet Saturday at Twin Brook Recreation Area. The other regional champions were Yarmouth in Class B and Waynflete in Class C.
Individually, Anna Slager of Gorham won in Class A, covering the 5-kilometer course in 19:48.37. Katherine Leggat-Barr of Greely won Class B (19:10.12) and Faith Blethen of Boothbay Region took Class C (20:20.23). The top 30 individuals and top 50 percent of teams in each class qualified for next Saturday’s state meets, also at Twin Brook. Bonny Eagle will seek its third state champion in four years, having won in 2012 and ’13. Scarborough, the defending champ, was second to the Scots on Saturday, 44-60. Marston paced Bonny Eagle with a second-place finish. The other senior, Elisabeth Redwood, placed 12th. The freshmen placed fourth (Ami Beaumier), fifth (Kayla Raymond) and 21st (Abigale Nelson). Laura Volan led Scarborough with a sixth-place finish. Emily Wasina’s seventh place paced Massabesic to third in the team standings. 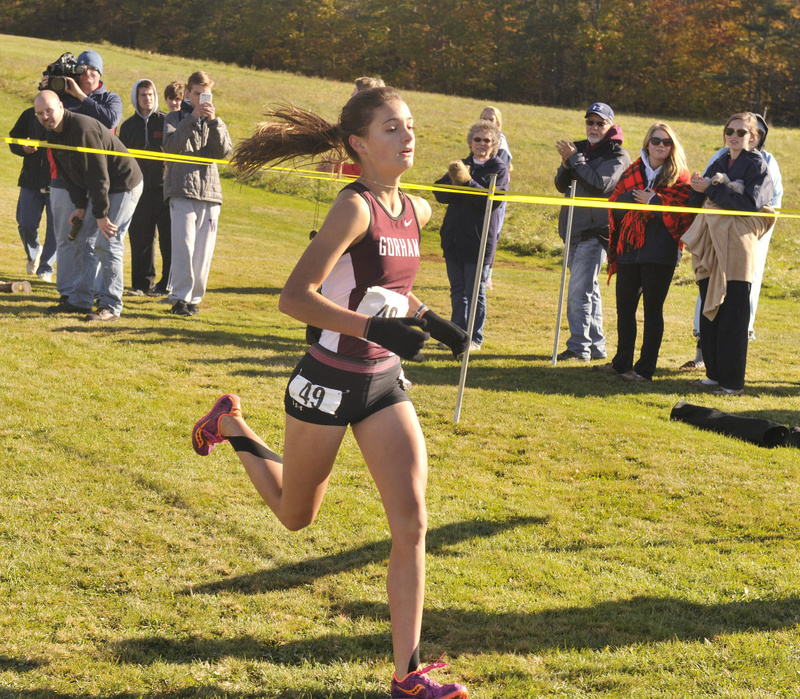 Falmouth was fourth, behind Gina Pardi’s 14th place. South Portland, Westbrook, Kennebunk and Windham also qualified for the state meet. Marston was second in 19:57.04 and McKenzie third in 20:02.62. In Class B, it came down to Yarmouth and Greely. Leggat-Barr and Carolyn Todd gave Greely a 1-2 finish, with Todd fighting off Abigail Hamilton of Yarmouth for second place (19:34.08 to 19:34.87). Hamilton’s teammate, Anneka Murrin, finished fourth (19:39), and the Clippers kept coming – with Grace Cowles (ninth), Georgia Giese (15th), Danielle Laverdiere (24th) and Lucy Alexander (25th). The Clippers totaled 55 points to Greely’s 74. “Our third runner, Cowles, had to be better than their third runner, and we match up from there,” Yarmouth Coach Bob Morse said. But the coach also knows there’s one more race. York placed third behind Kathryn Miller’s seventh place, Cape Elizabeth was fourth, paced by Liv Palma (fifth place). Freeport, Fryeburg Academy and Maranacook also qualified. In Class C, Waynflete put five runners in the top 28 to score 69 points to Maine Coast Waldorf’s 77. Abby Pipkin (sixth), Ellie Chidsey (eighth), Gail Johnson (10th), Sophia Mayone (17th) and Payton Sullivan (28th) paced the Flyers. Fiona Ahearne of Maine Coast placed third. The other Class C qualifiers were Boothbay, St. Dom’s, NYA and Monmouth.